TexWrite® MP10 is a high-performance cleanroom paper made of 100% synthetic substrate (Teslin®) with extremely low levels of particle generation. A unique material with outstanding performance characteristics, TexWrite® MP10 solves a number of problems inherent in cellulose based products including cellulose particle contamination, ink smearing and lamination requirements. 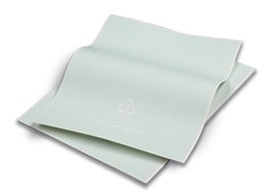 These cleanroom bond paper reams are appropriate for use in ESD-sensitive environments, antistatic and printable with minimal bleeding.